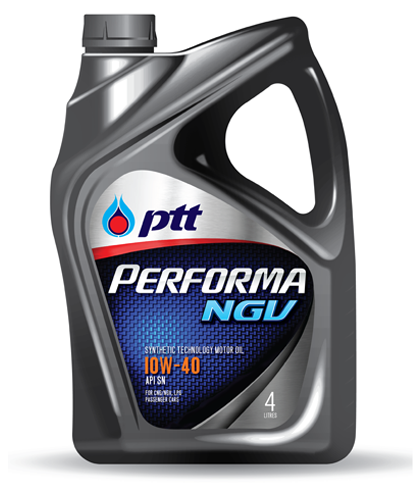 [PERFORMA NGV] น้ำมันเครื่องเทคโนโลยีสังเคราะห์ ออกแบบสำหรับรถยนต์เบนซินที่ใช้ก๊าซธรรมชาติ CNG/NGV หรือ LPG เป็นเชื้อเพลิงโดยเฉพาะ Synthetic technology motor oil. Recommended for high performance passenger cars running with CNG/NGV, LPG and gasoline fuel. • Designed for bi-fuel passenger cars using compressed natural gas (CNG/ NGV), LPG and gasoline fuel. • Recommended for vehicles using gasoline, ethanol blended gasoline E10, E20 and E85.